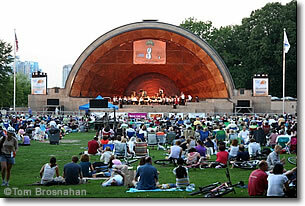 Boston's riverside park is great for walks, biking, sailing and outdoor summer concerts. The Charles River Esplanade (map) is the river's edge of Beacon Hill, on the north side. With its marina, the Hatch Memorial Shell for summer concerts, a bikepath, and lots of benches, it is the loveliest part of the Charles's banks. The Hatch Shell is the setting for the Boston Pops' famous Fourth of July concert extravaganza, featuring Tschaikowsky's 1812 Overture accompanied by the firing of brass cannons and a stupendous fireworks display over the Charles River. The esplanade is bounded on the landward side by busy Storrow Drive, one of Boston's main traffic arteries. This major road cuts off the esplanade from most of Boston. Access to the esplanade is by several pedestrian bridges that cross above the roadway. For example, the Arthur Fiedler Footbridge takes pedestrians and bikers from Beacon Street across to the esplanade. From the Public Garden's northwest corner (Arlington Street and Beacon Street), walk northwest until you see the footbridge (map). There is no parking available on the esplanade, although on summer Sundays the police sometimes allow parking on the north side of Storrow Drive which runs along the south side of the Esplanade. Otherwise, you must park somewhere else in Boston and reach the Esplanade on foot or by bicycle. Good places to park include at meters around the Public Garden (for a short Esplanade visit) or in the Boston Common Underground Garage beneath Boston Common (map) for a longer visit. Enter the Underground Garage by going north (it's one-way) on Charles St South. If you intend to visit Cheers, imagined locus of the television show of that name, you can combine that visit with some time on the Esplanade. Above, the Boston Landmarks Orchestra playing a free summer concert. 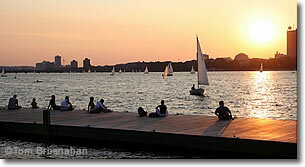 Below, sailboats cruise along the Charles River Esplanade.